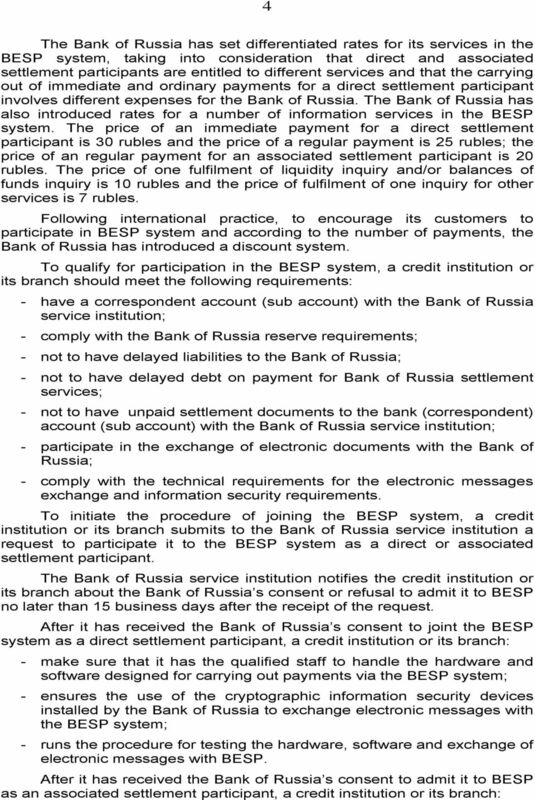 Download "A Brief Description of the Bank of Russia Real Time Gross Settlement System (BESP System)"
2 2 services received by the direct participants and cannot manage liquidity or the intraday queue of deferred payments. Payments are passed through the BESP payments system using electronic messages, which include details and other information necessary for carrying out payment. To exchange other information in the BESP system, electronic service information messages are used. 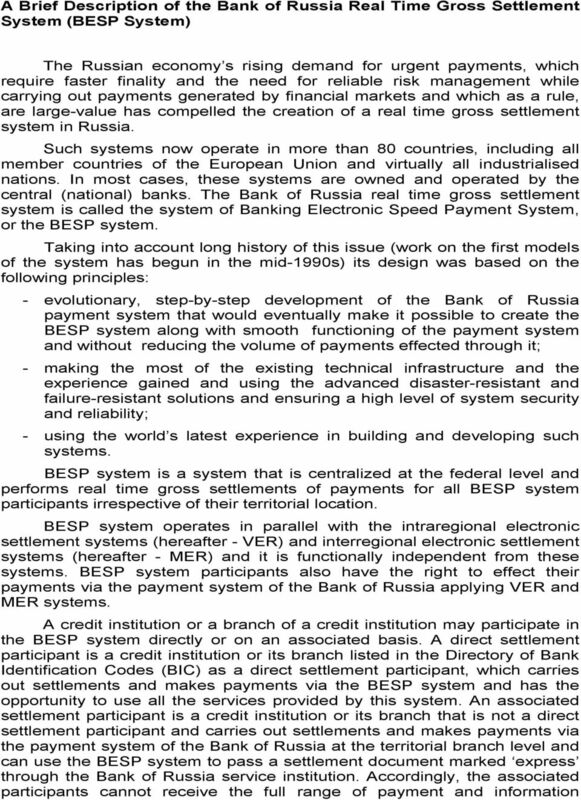 BESP system participants are free to determine the need to use BESP system to effect payments via the payment system of the Bank of Russia. To exchange electronic messages, participants may use the Bank of Russia telecommunication system and formats. In the future it would be possible to use the SWIFT system. The BESP system ensures the processing of payments during the BESP system operational day, that is, from 2.00 a.m. to 9.00 p.m., Moscow Time. Payment is debited from the participant-payer s, and credited to participant-recipient s account with the Bank of Russia s servicing institution during operational day with the same calendar date as the date on which the payment was processed via the BESP system. 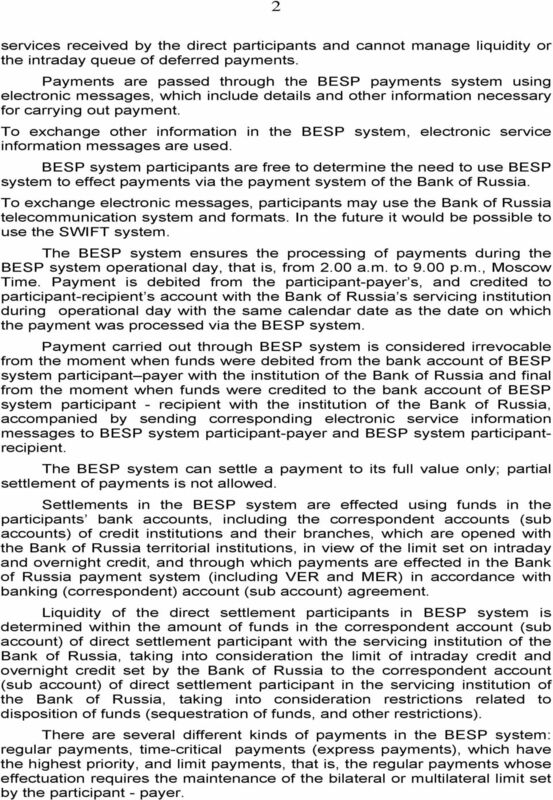 Payment carried out through BESP system is considered irrevocable from the moment when funds were debited from the bank account of BESP system participant payer with the institution of the Bank of Russia and final from the moment when funds were credited to the bank account of BESP system participant - recipient with the institution of the Bank of Russia, accompanied by sending corresponding electronic service information messages to BESP system participant-payer and BESP system participantrecipient. The BESP system can settle a payment to its full value only; partial settlement of payments is not allowed. 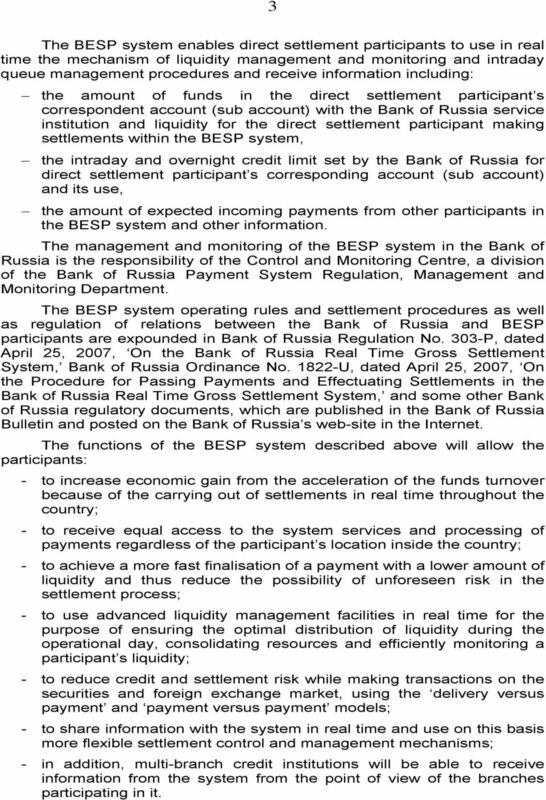 Settlements in the BESP system are effected using funds in the participants bank accounts, including the correspondent accounts (sub accounts) of credit institutions and their branches, which are opened with the Bank of Russia territorial institutions, in view of the limit set on intraday and overnight credit, and through which payments are effected in the Bank of Russia payment system (including VER and MER) in accordance with banking (correspondent) account (sub account) agreement. Liquidity of the direct settlement participants in BESP system is determined within the amount of funds in the correspondent account (sub account) of direct settlement participant with the servicing institution of the Bank of Russia, taking into consideration the limit of intraday credit and overnight credit set by the Bank of Russia to the correspondent account (sub account) of direct settlement participant in the servicing institution of the Bank of Russia, taking into consideration restrictions related to disposition of funds (sequestration of funds, and other restrictions). There are several different kinds of payments in the BESP system: regular payments, time-critical payments (express payments), which have the highest priority, and limit payments, that is, the regular payments whose effectuation requires the maintenance of the bilateral or multilateral limit set by the participant - payer. 3 3 The BESP system enables direct settlement participants to use in real time the mechanism of liquidity management and monitoring and intraday queue management procedures and receive information including: the amount of funds in the direct settlement participant s correspondent account (sub account) with the Bank of Russia service institution and liquidity for the direct settlement participant making settlements within the BESP system, the intraday and overnight credit limit set by the Bank of Russia for direct settlement participant s corresponding account (sub account) and its use, the amount of expected incoming payments from other participants in the BESP system and other information. The management and monitoring of the BESP system in the Bank of Russia is the responsibility of the Control and Monitoring Centre, a division of the Bank of Russia Payment System Regulation, Management and Monitoring Department. The BESP system operating rules and settlement procedures as well as regulation of relations between the Bank of Russia and BESP participants are expounded in Bank of Russia Regulation No. 303-P, dated April 25, 2007, On the Bank of Russia Real Time Gross Settlement System, Bank of Russia Ordinance No U, dated April 25, 2007, On the Procedure for Passing Payments and Effectuating Settlements in the Bank of Russia Real Time Gross Settlement System, and some other Bank of Russia regulatory documents, which are published in the Bank of Russia Bulletin and posted on the Bank of Russia s web-site in the Internet. The functions of the BESP system described above will allow the participants: - to increase economic gain from the acceleration of the funds turnover because of the carrying out of settlements in real time throughout the country; - to receive equal access to the system services and processing of payments regardless of the participant s location inside the country; - to achieve a more fast finalisation of a payment with a lower amount of liquidity and thus reduce the possibility of unforeseen risk in the settlement process; - to use advanced liquidity management facilities in real time for the purpose of ensuring the optimal distribution of liquidity during the operational day, consolidating resources and efficiently monitoring a participant s liquidity; - to reduce credit and settlement risk while making transactions on the securities and foreign exchange market, using the delivery versus payment and payment versus payment models; - to share information with the system in real time and use on this basis more flexible settlement control and management mechanisms; - in addition, multi-branch credit institutions will be able to receive information from the system from the point of view of the branches participating in it. 5 5 - makes sure that it has the qualified staff to handle the hardware and software designed for carrying out payments via the BESP system; - runs the procedure for testing the hardware, software and exchange of electronic messages with the Bank of Russia payment system at the level of the Bank of Russia s regional branch to carry out payments through the BESP system. Based on the results of the work done, the Bank of Russia no later than 10 operational days takes a decision whether the credit institution or its branch is ready or not to participate in the BESP system as a direct or associated settlement participant. Processing of payments in the BESP system has started on December 21, 2007. RULES OF SECURITIES TRADING OF THE CLOSED JOINT-STOCK COMPANY "MICEX STOCK EXCHANGE"
(text consolidated at 20 June 2012)* * 1) The Rules adopted by the Supervisory Board by Resolution No. 1/1110/2006 dated 4 January 2006, as amended by the Exchange Supervisory Board: - by Resolution No. General Terms and Conditions of UniCredit Bank Austria AG comparison of modified or amended sections with the old version. 1. Terms and General Provisions 1.1. Business Day is a day when the Bank is open for making a respective payment transaction. The Bank may have different business days for different types of payment transactions. APPROVED BY Company General Director Order No. 7/р dated 24 March 2016 with effect from 7 April 2016. ROBOKASSA Services Agreement (version 3. 2003 ISDA. Credit Derivatives. Definitions ISDA INTERNATIONAL SWAPS AND DERIVATIVES ASSOCIATION, INC.
BT 24 User Manual 1. Useful information... 4 2. Application access... 6 2.1 First log into BT24... 6 2.2 Subsequent logins into BT 24... 6 2.